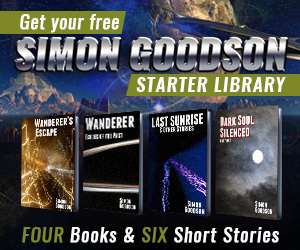 All work on Wanderer’s escape is now complete and can be bought from Amazon now. Needless to say I’ve got a huge grin on my face and can’t wait to see what people make of it. Just read and enjoyed the “Wanderer”. Looking forward to the sequel. My only hope is that Jess will mature more quickly in what appears to be a violent galaxy. Will post on Amazon! Thanks for the feedback – I’m really pleased you enjoyed it. I’m working on the first two books in a fantasy series at the moment (one is complete and being proofread, the other is 10k words in) then I’ll be returning to the Wanderer series. The sequel will follow Jess and the Wanderer farther out into the galaxy and I’m already excited about what they will find. I just read Wanderer’s Escape and I thoroughly enjoyed it. I like how you managed the feel of uncertainty and trust. I had to work at it if I wanted to perceive the ship as anything less than logical, because you are consistent with your logic internal to the story. Thank you for writing this and putting it out there.